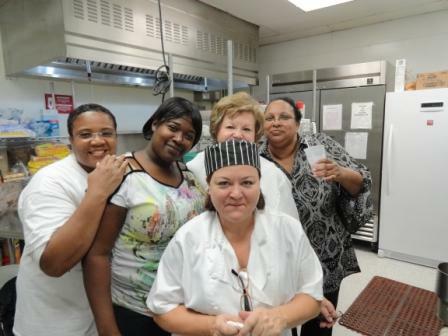 Chef Pat Walston (center) with Magnolia Place staff (L-R) Cynthia Daye, Tasha Howard, and Vonda Ashford. September 23, 2011 (Goldsboro, NC) — Pat Walston, Corporate Chef for House-Autry Mills volunteered her time recently to conduct a cooking class at RHA Howell’s Magnolia Place in Goldsboro, NC. Magnolia Place is a 24-hour supported living program for people with disabilities. Its mission is to provide quality training and residential services for selected students of the Work Source East Vocational Rehabilitation Facility. Seventeen Magnolia Place residents attended the hands-on cooking class to learn how to prepare an Italian menu. them into three smaller groups: one to prepare the appetizers, one to prepare the entrees, and another to prepare dessert. With assistance from Magnolia Place staff members, Chef Pat demonstrated techniques of cooking as the group prepared Caprese salad skewers (appetizers), two hand-made deep-dish pizzas, hand-made meatball subs (the students prepared the meatballs one by one), and a chocolate brownie trifle for dessert. 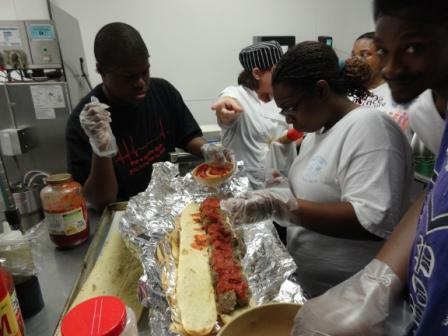 In the process, they learned how to prepare an actual meal and how to work together as a team in the kitchen. Afterward, they all sat together and enjoyed the meal. “We are so grateful to Chef Pat for donating her time to the Magnolia program and for giving back to her community,” said RHA Howell’s marketing director Debbie Valentine, who joined in the fun as a member of “Team Brownie” to make dessert. Chef Pat Walston, who lives in Goldsboro, is a regular participant in RHA Howell’s annual “Epicurious Vino Challenge” fundraiser held each summer at Hinnant Family Vineyards in Pine Level, NC. The challenge requires professional chefs to use a Hinnant wine as a main ingredient in a signature dish. Chef Pat received an Honorable Mention in the People’ Choice category. Magnolia Place is located at 1401 Salem Church Road, Goldsboro, NC 27530. For more information about the Magnolia Place program, contact Charlotte Wooten, Residential Director at 919-734-9039 or visit www.rhahowell.org. RHA Howell is a not-for-profit 501(c)(3) organization that has been helping people with disabilities and special needs, and their families, make choices to live more independently for nearly 40 years. Integrity, high standards for quality and hard work are at the core of every RHA Howell disability assistance program. Proven leaders in caring for people, RHA Howell, Inc. is a pioneering force in the field of human services, particularly supporting infants and children. For more information, go to www.rhahowell.org.